Village of Walkeshwar, Malabar Point, Bombay. bl.uk > Online Gallery Home	> Online exhibitions	> Asia, Pacific and Africa Collections	> Village of Walkeshwar, Malabar Point, Bombay. 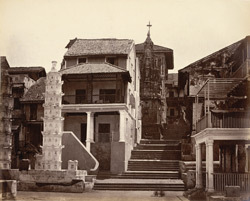 Photograph with a view of the village surrounding the Walkeshwar Temple in Bombay (Mumbai), Maharashtra, by an unknown photographer, from an album of 40 prints taken in the 1860s. The busy port and industrial hub of Bombay is the capital of Maharashtra. During British rule, it was the administrative capital of the Bombay Presidency. Extending over a peninsula into the Arabian Sea on the west coast of India, Bombay prospered with maritime trade and became the chief commercial centre of the Arabian Sea. Originally a collection of fishing villages of the Koli community built on seven islands, Bombay was by the 14th century controlled by the Gujarat Sultanate who ceded it to the Portuguese in the 16th century. In 1661 it passed to the English as part of the dowry brought to Charles II by the Portuguese princess Catherine of Braganza. The Walkeshwar Temple is situated on the highest point in Bombay, Malabar Hill. An ancient Hindu devotional site of Bombay, the temple was dedicated to the Sand-Lord, to commemorate the occasion when Rama, the hero of the Hindu epic 'Ramayana', built a Shivalinga of sand and prayed to Shiva. Originally built by the kings of the Silhara dynasty who ruled Bombay from the 9th-13th centuries, the temple was destroyed by the Portuguese and subsequently rebuilt in 1715.